As the days get colder have you ever noticed that some people catch every bug that’s doing the rounds and other people are always bursting with energy? Although it’s easy to put it down to luck, it’s often down to our inbuilt self-defence team - the immune system. And when it comes to keeping your immune system firing on all cylinders through the winter months, it’s essential that you’re getting your daily vitamins. To stay healthy and fight off infections big and small, it’s important that your body’s natural killer cells are on top form. Known as T-cells, these amazing fighting units go after any virus-infected cells, killing and neutralising them before you even start to sniffle. T-cells quickly identify and eliminate enemy invaders like bacteria and viruses. But to work at full capacity, you’ll need to keep those T-cells happy. Eat a balanced diet and don't skip meals if you want to nourish your T-cells and keep your immune system perky all winter. 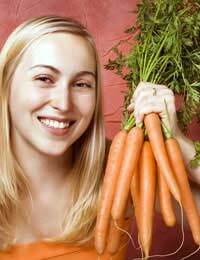 Choose foods with high antioxidant levels like oranges, strawberries, kiwi fruit, broccoli, carrots and cabbage. Many experts believe that antioxidant vitamins, like vitamin C, vitamin A and vitamin E can help give your immune system a big boost and reduce the risk of serious illness. So go ahead and eat up! A simple way to get more antioxidant vitamins into your diet is to drink more green tea. People in the East drink green tea regularly and many people believe it to be the secret of longevity in Eastern cultures. It’s an acquired taste, but try taking just one cup a day and building up slowly as they days get colder and the nights get longer. Many people boost their immune system with a regular, high-quality multivitamin. Once again, antioxidants are key, so look out for the main ones – vitamins C, A and E – in any supplements you buy. But experts recommend you avoid faddish, high dosage vitamin supplements as they can do more harm than good and any benefits are generally unproven. When the sun is high in the sky and the temperatures are warm, it feels easy to eat crisp, nutritious salad and snack on fruit. But once the sky turns grey and you reach for your woollies and wellies, the temptation is to comfort eat on stodgy puddings, chips, pies and chocolate. Instead of going for a run in the fresh air after work, it’s just as easy to curl up on the sofa with a vitamin-killing bottle of wine. So what’s the key to eating well all winter and keeping your intake of vitamins up high? Remember that it’s not just green leafy vegetables that contain essential nutrients. Rice, potatoes, pumpkin, baked beans and wholemeal bread are just a few examples of hearty foods that are rich in vitamins. And if you’re worried about the lack of fresh vegetables in the winter months, you needn’t be. Often fast-frozen vegetables have a higher vitamin content than their ‘fresh’ counterparts. That’s because freezing keeps the vitamins locked into the vegetables, whereas food that’s been stacked in a cardboard box or sitting in a cupboard has been losing its vitamin content day by day. Vitamin D is unusual. We get most of our vitamins from our food and drink, but much of our supply of vitamin D comes from our exposure to sunlight. During winter, not only do we see less sunshine, and even when the sun is out, many of us are stuck in our offices or workplaces, but when we do venture outside, our skin is covered up because of the low temperatures. So it might be a good idea to check that you’re getting enough vitamin D in your food. Good sources include dairy products, oily fish such as salmon or sardines, margarine and eggs. Whatever the time of year, it’s important to get enough vitamins to keep your immune system and its crucial killer T-cells up and running. But during the colder winter months, with colds, ‘flu and other viruses out in abundance, eating well becomes even more of a high priority. So minimise the comfort eating, or nourish and nurture yourself with hearty stews and soups choc-full of vegetables. Don’t give into too much alcohol and try to keep your diet varied and balanced. You’ll find yourself still fighting fit come springtime.